Neil Gorsuch, President Donald Trump's nominee for the U.S. Supreme Court, has ruled against the Affordable Care Act's contraception coverage mandate and vehemently opposes assisted suicide. Gorsuch, a federal judge on the 10th U.S. Circuit Court of Appeals for a decade, was nominated by Trump to fill a vacancy left by the unexpected death of conservative Judge Antonin Scalia nearly a year ago. If Gorsuch's nomination is approved, the majority of justices on the court will have been appointed by Republican presidents. Right now, the court is split 4-4. Senate Democrats have signaled they may oppose the nomination. The GOP holds 52 Senate seats, but the nomination requires 60 Senate votes. Senate Majority Leader Mitch McConnell can also require the nomination only needs to pass with a simple majority. Although Gorsuch, 49, has never ruled on abortion rights, his opinions on contraception and assisted suicide signal he opposes it. In two separate cases, Gorsuch ruled against the ACA contraception mandate. Gorsuch sided with Hobby Lobby in a 2013 suit against the HHS claiming the company shouldn't be required to cover contraception as part of their employer-sponsored health plans because that would be in conflict with the religious beliefs of the company's founders. The Supreme Court eventually ruled, 5-4, in favor of Hobby Lobby. President Donald Trump publicly said on the campaign trail he will nominate a candidate that supports overturning Roe v. Wade. The conservative leanings of Gorsuch however likely won't be enough to dismantle abortion rights under Roe v. Wade. In a 5-3 decision, the Supreme Court last June struck down a Texas law that limited women's access to abortion procedures. Supreme Court Justice Anthony Kennedy ruled in favor of abortion access in the case although he has nominated by Republican President Ronald Reagan. Greenberger said that Gorsuch could still sway the court's votes on related matters. Several states have passed measures that limit access to abortions, and some may end up in front of the Supreme Court. Justice Kennedy's swing vote can't always be relied upon to rule in favor of abortion rights and Gorsuch will influence the opinion of the court with his own line of questioning, Greenberger said. Gorsuch also authored a book, The Future of Assisted Suicide and Euthanasia, which argued against the practice. Organizations that support abortion rights and assisted suicide publicly oppose Gorsuch's nomination. “A judge who is willing to allow others, including corporations, to impose their religious beliefs on individuals making personal healthcare decisions at the end of life would be a dangerous addition to the nation's highest court,” said Kevin Díaz, national director of legal advocacy for Compassion & Choices, an organization that supports assisted-suicide practices. Medical aid in dying is currently legal in six states. The Supreme Court hasn't ruled on the matter and has referred the issue to the states. 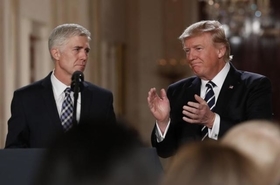 Robin Fretwell Wilson, a law professor at the University of Illinois, said it is likely that even despite Gorsuch's opposition to aid-in-dying he would agree with the higher court that it should be left up to the states to decide the issue. Wilson said based on opinions and published works by Gorsuch, he is a strong supporter of the important role local legislative bodies have to govern. He has said that “we are too quick to rely on judges for cultural issues, and that we should go to our legislators,” Wilson said. The imminent repeal of the ACA also places greater importance on the Supreme Court, Greenberger said. The uncertainty a repeal will cause in healthcare may lead to more litigation. “If anything it enhances the importance of an already very important Supreme Court nomination,” she added. There is a possibility Trump could fill more seats. Two members of the court's liberal wing—Justices Ruth Bader Ginsburg, 83, and Stephen Breyer, 78—as well as swing voter Kennedy, 80, could contemplate retirement during Trump's administration.